A calcium antagonist, nifedipine, causes gingival overgrowth as a side effect. It has been confirmed that the Japanese traditional medicine, Saireito, inhibits the nifedipine-induced proliferation of gingival fibroblasts in vitro. We performed an in vivo experiment to determine whether Saireito has a therapeutic use in the treatment of nifedipine-induced gingival overgrowth. The rats had significant gingival overgrowth induced by the administration of nifedipine. The space between the submandibular incisors and the width of buccal gingiva of maxillary left first molar were macroscopically measured. The buccal gingiva was microscopically examined. 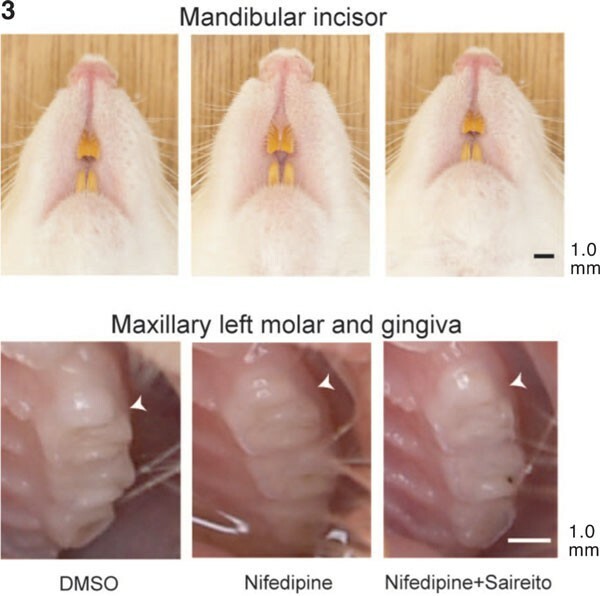 Eight weeks after Saireito was administrated together with nifedipine, Saireito decreased both the incisor space and the gingiva width which had been enlarged by nifedipine and furthermore, the area of connective tissue of nifedipine + Saireito group was significantly smaller than that of nifedipine alone. In conclusion, Saireito may be clinically effective in therapy for calcium antagonist-induced gingival overgrowth. Although there are many therapeutic drugs for the treatment of hypertension, calcium (Ca2+) antagonists, such as nifedipine, verapamil, and diltiazem, are frequently used as quick-acting agents. Regrettably, however, Ca2+ antagonists cause gingival overgrowth as a side effect by an increase in collagen and fibroblast densities . Since the detailed pathogenic mechanism underlying gingival overgrowth remains unknown, gingival overgrowth is treated surgically. Hence, the development of treatment based on cause is urgently needed. Recently, as a result of an in vitro experiment, we reported that the Japanese traditional medicine, Saireito (Chai-Ling-Tang in Chinese) , or its main component, Saiko , inhibits the proliferation of gingival fibroblasts, the release of basic fibroblast growth factor (bFGF), and the synthesis of type I collagen. Saireito is taken as a granulated drug with drinking water in order to cure water diarrhea, acute gastroenteritis, edema and so on. This medicine is a powdery mixture of dried extracts of 12 plants such as Bupleurum falcatum (17.5%w/w), Pinellia ternate (12.5%), Alisma orientale (12.5%), Scutellaria baicalensis (7.5%), Zizyphus vulgaris (7.5%) etc. . In addition, the chemical components of Saireito have been clarified by analysis with HPLC and thereby, it is known that Saireito is composed of many clinically active compounds, e.g., baicalin, oroxylin A, wogon, glycyrrhizin, and saikosaponin . Thus, Saireito may be effective in therapy for gingival overgrowth. In the present study, an in vivo experiment was performed to determine whether a Japanese traditional medicine, i.e., Saireito, is useful in treating Ca2+ antagonist-induced gingival overgrowth. Twenty-four male Wistar rats, 4 weeks of age and weighing 80-88 g, were used (Figure 1A). At first, twelve of the rats had significant gingival overgrowth induced by the administration of nifedipine (250 mg/kg/day po × 6 weeks), as previously described . The 12 rats were equally divided into two groups: 1) treatment with nifedipine alone (n = 6) and 2) treatment with nifedipine plus Saireito (n = 6). Saireito was administrated at a dose of 500 mg/kg/day po [4, 6]. For administration to the rats, a nifedipine solution (125 mg/ml) was made by dissolving nifedipine powder in dimethyl sufoxide (DMSO). A Saireito suspension (250 mg/ml) was made by stirring Saireito powder in distilled water for 24 hours at room temperature and was kept in a refrigerator (5°C) until the administration. (A) Experimental design for Saireito therapy of nifedipine-induced gingival overgrowth in rats. The numbers in parentheses represent the number of rats used for each of the experiments. (B) Measurements of incisor space and gingiva width. The space between the tips of the mandibular incisors and the width of buccal gingival together with the maxillary left first molar were measured as the incisor space and the gingiva width, respectively. (C) Morphometric analysis of gingival overgrowth. The area of an orange-colored part (connective tissue) surrounded by a dotted line was measured. The remaining 12 rats were administrated DMSO (2 ml/kg/day po × 6 weeks) and therefore, served as the nifedipine control group. These control rats were also equally divided into two groups: 1) treatment with DMSO alone (n = 6) and 2) treatment with DMSO plus distilled water (H2O) (n = 6). The nifedipine control group was administered DMSO (4 ml/kg/day po), while the nifedipine plus Saireito control group was administrated DMSO (2 ml/kg/day po) plus H2O (2 ml/kg/day po). All 4 groups were provided a diet (LabDiet 5053; Japan SLC, Shizuoka, Japan) and drinking water ad libitum. In order to check for macroscopic changes in the rat gingiva after the Saireito treatment, under ether anesthesia, the mandibular incisors and the buccal gingiva together with the maxillary left first molar were photographed (E-330; Olympus, Tokyo, Japan) once every 2 weeks. The space between mandibular incisors was chosen for measurement since it has been reported to increase with swelling of the gingiva . When photographing the molars, the mouth was opened by two dental remedy wires. The images were enlarged approximately 6 times by a computer (VY17F/DG-M; NEC, Tokyo, Japan) and thereafter, the space between the tips of the incisors and the width of the gingiva were measured with a ruler (Figure 1B). After an 8-week period of the Saireito treatment, the maxillary left first molar with its surrounding tissues were dissected under pentobarbital sodium (40 mg/kg ip) anesthesia. The extirpated tissues were then immediately fixed in 4% paraformaldehyde fixative solution. The specimens were demineralized in 10% ethylenediaminetetraacetic acid (pH 7.4). The specimens were then processed and embedded in paraffin. Frontal-cut sections, 4 μm in thickness, were processed with a microtome. After consecutive sectioning, the specimens were stained with hematoxylin-eosin (HE) and azan, and observed by light microscopy. Morphometric analyses were performed (Figure 1C). Cross sections of the molar were used for the histological examination of the maxillary molar buccal gingiva. The measured portion of the buccal gingiva is an area surrounded by the basement membrane of gingival epithelium, root surface and straight lines to be perpendicular to the tooth axis via the upper end of the alveolar bone. The buccal gingiva thickness was observed with captured images of maxilla sections stained with HE by using a microscopic-digital camera system (model BX61-DP71, Olympus, Tokyo, Japan). A stage micrometer was used for the calibration of measurements. Each cross-sectional profile of specimens obtained by using a magnification of x4 and representative fields under x20 objective was photographed with a digital camera. All morphometric parameters were counted by light microscopy using image analyzing computer program (Image-Pro Plus Ver. 4.5, Microsoft, WA, USA). The rats were handled according to the Guiding Principles for the Care and Use of Laboratory Animals, as approved by Matsumoto Dental University. Nifedipine was purchased from Sigma (St. Louis, MO, USA). Saireito (TJ-114) was a generous gift from the Tsumura Co., Ltd. (Tokyo, Japan). DMSO and ether were obtained from Nakalai Tesque Co., Ltd. (Kyoto, Japan). Data are expressed as the mean value ± the standard error of the mean and the number of observations (n). Statistical analyses of the data were performed by Student's 2-sided simple t-test. Differences between the mean values were considered significant if the probability of error (p) was less than 0.05. The incisor spaces and gingiva widths in the nifedipine group were significantly increased in comparison with the control group before administrating Saireito (data not shown). Figure 2 illustrates the statistical analyses of the nifedipine control (DMSO), nifedipine, nifedipine plus Saireito control (DMSO + H2O), and nifedipine plus Saireito groups. There were significant differences in the incisor space and gingiva width 6 and 8 weeks after starting the administration of Saireito, respectively; these results indicated that Saireito clearly suppressed nifedipine-induced gingival overgrowth. In addition, there were significant differences between the nifedipine and DMSO groups throughout the experiment. Moreover, both of the differences in the incisor space and gingiva width between the nifedipine plus Saireito and its control (DMSO + H2O) groups resolved 6 weeks after starting the Saireito administration. Effects of Saireito on nifedipine-induced gingival overgrowth. Significant differences in incisor space and gingiva width between the nifedipine plus saireito and nifedipine groups resolved 6 weeks after starting the Saireito administration. *p < 0.05, **p < 0.01, ***p < 0.005, ****p < 0.001, n = 4 -6. 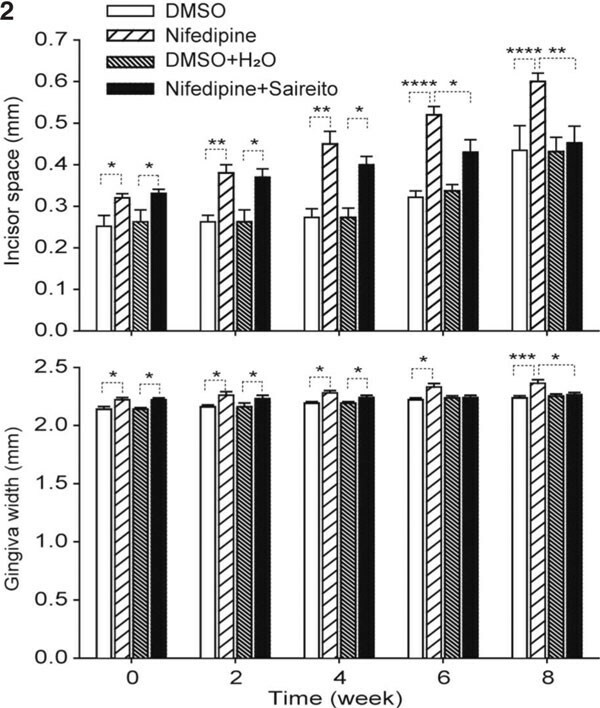 Figure 3 shows the comparison of incisor spaces and gingiva widths between the DMSO, nifedipine alone, and nifedipine plus Saireito groups. Eight weeks after starting the Saireito administration, the addition of Saireito to nifedipine inhibited both the increases in incisor space and gingiva width induced by nifedipine alone. Macroscopic comparisons between the nifedipine control (DMSO), nifedipine alone, and nifedipine plus saireito groups. Saireito decreased both incisor spaces and gingiva widths which had been increased by nifedipine. Arrow heads represent the edge of buccal gingiva. The histopathologic features of gingival specimens in the DMSO, nifedipine, and nifedipine plus Saireito groups are shown in Figure 4A. In HE-stained specimens, there were obvious dimensional differences between the nifedipine and nifedipine plus Saireito groups. Specifically, nifedipine induced a remarkable increase in the number of fibroblasts and vessels, which were inhibited by Saireito. The features were clearly observed in azan-stained specimens. Saireito decreased collagen formation and inhibited vessel enlargement. On the other hand, in the DMSO, DMSO plus H2O (specimen not shown), and nifedipine plus Saireito groups, there were no histopathologic differences in the gingival connective tissue. (A) Histopathologic features of gingival specimens of the DMSO, nifedipine, and nifedipine plus Saireito groups. In HE-stained specimens, it was confirmed that the nifedipine-induced increase in the number of fibroblasts was inhibited by Saireito. In azan-stained specimens, it was clearly observed that Saireito decreased collagen formation and inhibited vessel enlargement. (B) The morphometric analyses of gingival overgrowth. There were significant differences in the area of connective tissue between the nifedipine and nifedipine plus Saireito groups and between the DMSO and nifedipine groups. *p < 0.05, ***p < 0.005, n = 3 (in each case). Figure 4B shows the morphometric analyses of gingival overgrowth. There were significant differences in the area of connective tissue between the nifedipine and nifedipine + Saireito groups and between the DMSO and nifedipine groups. Saireito inhibits cell proliferation in mesangial cells  and fibroblasts in idiopathic retroperitoneal fibrosis . However, the use of Saireito for therapy of gingival overgrowth has not been reported. In the present study, we have confirmed that Saireito is effective therapy for nifedipine-induced gingival overgrowth in the rat. Because the measurements (incisor space, gingiva width, and connective tissue area) of the nifedipine plus Saireito group were not less than the corresponding measurements of the control group, we concluded that the Saireito-induced inhibition of gingival overgrowth was not due to cytotoxicity. When Saireito inhibited nifedipine-induced gingival overgrowth, the body weights (data not shown) of the nifedipine group were significantly below the control group, while such was not the case in the nifedipine plus Saireito group. This finding indicated that the Saireito-induced effect on gingival overgrowth was not attributable to either nifedipine-induced hypertrophy or atrophy of the gingiva. 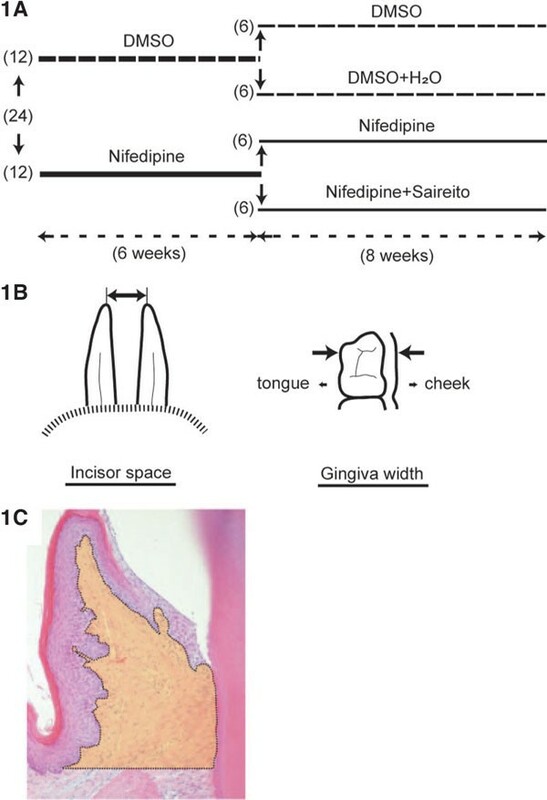 In in vitro experiments, Saireito inhibited nifedipineinduced cell proliferation within 2 weeks , while in in vivo experiments, Saireito inhibited gingival overgrowth in 6 or 8 weeks. Since there was a difference in the methods used, the temporal difference in this effect may be caused by the difference of the Saireito concentration acting on the gingival fibroblasts or by the manner in which Saireito was partially metabolized in the body. Since Saireito is an anti-inflammatory agent that has saikosaponin and glycyrrhizin as main components, it is not surprising that Saireito inhibited the production and release of chemical mediators in peripheral tissues. Hsu et al. reported that saikosaponin D inhibited the growth of cells in the human cancer cell line, A549. Matsumoto and Fujii  reported that tenidap, an anti-inflammatory agent, inhibited collagen synthesis in cultured human gingival fibroblasts. Thus, we propose that depression of both bFGF exocytosis and collagen synthesis as a result of steroidal effect of saikosaponin and glycyrrhizin in gingival fibroblasts is involved in the characteristic growth-inhibiting effect of Saireito. From the present histopathologic studies, it has been confirmed that nifedipine-induced gingival overgrowth results from proliferation of fibroblasts in the buccal direction, as well as along the teeth, along with an increase in collagen. The former response indicates that the gingival sulcus is deepened. Morisaki et al. recently observed the same phenomena. Since it was observed that the associated vessels became enlarged and increased in number, these actions may be related to gingival overgrowth as well. Indeed, since nifedipine is a Ca2+ channel blocker, it is not surprising that the vessels became enlarged. In addition, Miura et al. reported that nifedipine induces angiogenesis in human coronary arteries, thus supporting our observation. 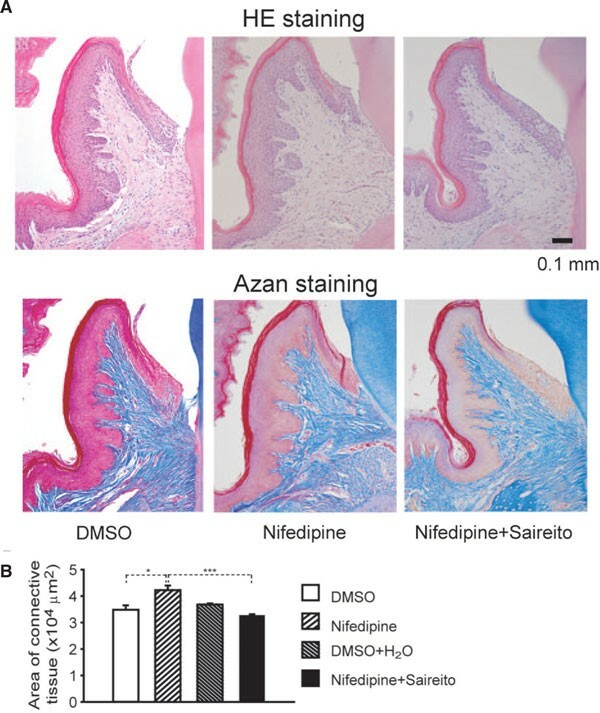 Based on the findings reported herein, we conclude that Saireito inhibits nifedipine-induced gingival overgrowth in vivo. Thus, Saireito may be clinically effective in the treatment of Ca2+ antagonist-induced gingival overgrowth.